Thessalonica was the principle city and primary port of Macedonia in what today is Greece. It was founded in 316 B.C. during the reign of Alexander the Great. It became an important city under Roman rule as well in 146 B.C. It was located at the junction of the main land route from Italy to the East and the main route from the Danube down to the Aegean Sea. New Testament references to Thessalonica are solely in connection with Paul's missionary journeys. Thessalonica was a place that Paul achieved substantial success and a prominent following. His First and Second letters to the Thessalonians were written to the congregation there. Thessalonica was located at the intersection of two major Roman roads, one leading from Italy eastward (Ignatia Way) and the other from the Danube to the Aegean. ThessalonicaÕs location and use as a port made it a prominent city. In 168 B.C. it became the capital of the second district of Macedonia and later it was made the capital and major port of the whole Roman province of Macedonia (146 B.C.). In 42 B.C., after the battle at Philippi, Thessalonica was made a free city. 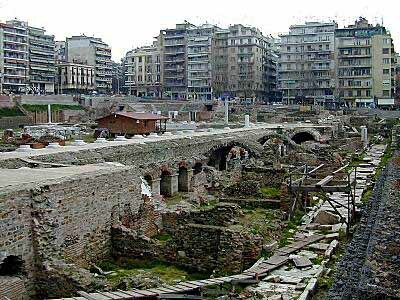 Very little has been uncovered at ancient Thessalonica because Thessaloniki sits atop the remains. The area pictured above and at right was formerly a bus station; when it was moved in 1962, this 1st or 2nd century A.D. forum was revealed. Excavators found a bathhouse and mint dating to the 1st century A.D. below pavement surrounding an odeum. An inscription (30 B.C. to 143 A.D.) from the Vardar gate bears the word politarches, the word Luke used in reference to the officials of the city before whom Jason was brought by the mob (Acts 17:6). The word does not appear in any other Greek literature but does match the archaeology of the site. St. Demetrios was a native of Thessalonica whom Galarius put to death. This basilical church was first built in the 5th century A.D. and remembers St. Demetrios as the city's patron saint. The largest church in Greece, this basilica was destroyed by fire in 1917 and has since been reconstructed (pictured above and right). Today the modern city of Thessaloniki is the second most important city of Greece and home to a million inhabitants.